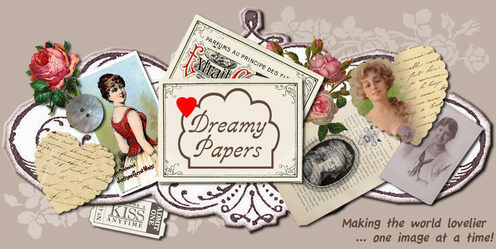 ATC & ACEO Displays & Gifts | Dreamy Papers - unique new and old papers worth dreaming about! If you don't know what ATCs or ACEOs are - they are art cards that are great for collecting and enjoying art. ATC stands for "Art (Artist) Trading Card". Traditionally these are always traded, never sold. ACEO stands for "Art Cards, Editions & Originals" which came into being late 2004 when artists wanted to sell these on eBay. ACEOs are always a standard size - 2.5 x 3.5" - and, if it's not that size, then it is not considered an ACEO. If you're not familiar with these wonderful tiny treasures, google online, and selling places like Etsy and eBay feature art in this format. They are versatile as gifts, and collectibles - they fit into trading card albums, and are the size of a regular playing card. Here are some great ideas for displaying them. TIP: Always carry an old standard size playing card in your wallet or handbag, so you can check out sizes against frames, etc. This is one of those times that carrying a playing card around with me, paid off. 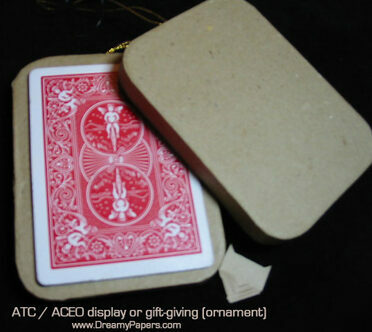 This paper-mache ornament is a great size for displaying or gifting an ATC/ACEO. I saw these in Michaels Craft Stores around Christmas time one year. Paint, collage, or decorate the ornament anyway your heart desires. Add some 'bling' - maybe sparkling rhinestones around the edges. Then use photo corners to attach the card to the surface. Or you may find other creative ways - there are all manner of clips and other items to use - miniature clothes pegs, for instance.